Skype Users Online Acceleration: Is this a Microsoft effect? Around 2 p.m. Eastern Daylight Saving Time today (March 11, 2012), Skype Users Online went over 36 million for the first time. It’s not simply a matter of crossing this line but more a question of why the rapid growth of Users Online over the past two weeks. Update Monday, Mar. 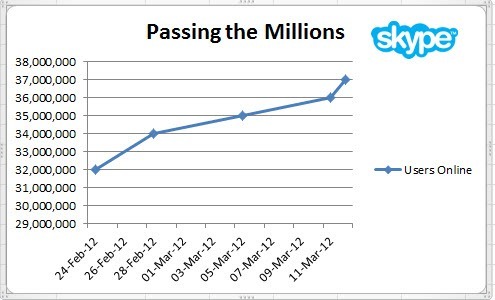 12: At approximately 12:45 EDT (GMT-4) Skype users online crossed 37 million. Has Microsoft developed a new formula to measure users online? 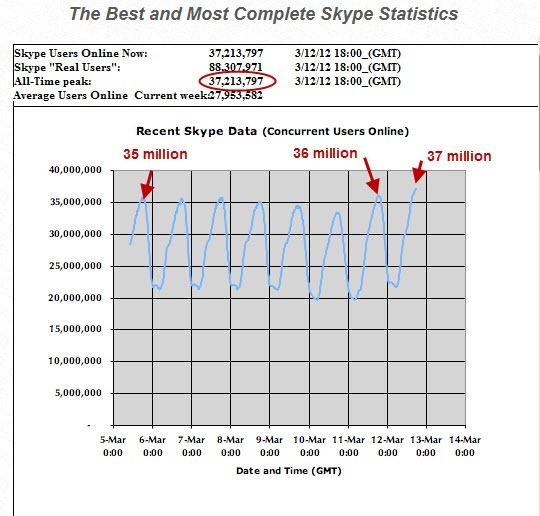 Skype users online peaked out today at 2:15 p.m. EDT at 37, 549,152. Over the past several years Hudson Barton has tracked the number of Skype users online every fifteen minutes and graphs it out for us. 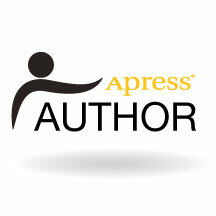 Usually we would see weeks or even months between crossing successive “million” users online increments. But, since the launch of Windows Phone Mobile, which coincided with the opening of Mobile World Congress in Barcelona where Skype WiFi access was free during the conference, we have seen rapid growth past 32 million (Feb. 24), 34 million (Feb. 28), 35 million (Mar. 5) and 36 million (today Mar. 11) in a matter of days. These are numbers that have crept up to, and now surpass, the population of Canada. There continues to be the daily cycles as various regions of the world come online during the day but it’s the overall peaks (usually around noon to 2 p.m. Eastern time) that interest us here. Another first: the number of users online peaked out on a Sunday; normally there is a decline in users online over the weekends. Is it the result of being able to make enquiries about using Skype through Skype’s recently launched inbound sales initiative (U.S., Canada, U.K. initially)? Has Skype for TV finally taken off? 36 is both the square of 6 and a triangular number, making it a square triangular number. It is the smallest square triangular number other than 1, and it is also the only triangular number other than 1 whose square root is also a triangular number. It is the smallest number n with exactly 8 solutions to the equation ? (x) = n. Being the smallest number with exactly 9 divisors, 36 is a highly composite number. Adding up some subsets of its divisors (e.g., 6, 12 and 18) gives 36, hence 36 is a semiperfect number. 36 is the number of degrees in the interior angle of each tip of a regular pentagram. The thirty-six officers problem is a mathematical puzzle. The number of possible outcomes (not summed) in the roll of two distinct dice. 36 is the largest numeric base that some computer systems support because it exhausts the numerals, 0-9, and the letters, A-Z. See Base 36. In base 10, it is a Harshad number. Since it is possible to find sequences of 36 consecutive integers such that each inner member shares a factor with either the first or the last member, 36 is an Erd?s–Woods number. Does this have something to do with Tiger Woods golf score? Because 362 + 1 = 1297, a prime, which is obviously more than 2 × 36, 36 is a Størmer number. The sum of the integers from 1 to 36 is 666 (see number of the beast). The number of inches in a yard. And most importantly: In the UK, a standard beer barrel is 36 UK gallons, about 163.7 litres. And, finally, it’s about 4% more than the population of Canada. Bottom line: ??? Feel free to speculate in the Comments below. But the real bottom line is that Skype usage growth has gone somewhat viral again. Maybe someone at Skype could open the kimono a bit?